Oops, this post has moved to my new blog, Travel and Travails. If you’re interested in the white Spanish village of Gaucin, I highly recommend it! Click here to read about the village house we rented in Gaucin and our experience in this charming Spanish village. For other Spanish villages, I recommend Frigiliana, near Nerja, and Javea, just south of Valencia. « Javea, Spain: Our New Home! Yes, the girls are growing so much! I went to carry Emma into her bed last night and could barely manage to pick her up. Given that she’s now up to my shoulder in height, maybe it’s time to put that endeavor to bed! I thought the same thing myself — how tall the girls look. Especially Grace, it seems she has just shot up all of the sudden! The view of the Rock of Gibraltar is spectacular. I’m sitting here with Alex this morning showing him all the pictures. We are enjoying them all! I hope you are enjoying Gaucin. We shall be over next from 13th to 18th August … so if you are in Casares perhaps we can meet up there for a drink …. 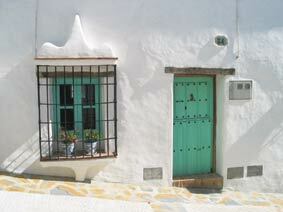 or you could visit us in Gaucin and see another village house. Ours is on 5 floors, and has that wonderful view from the top terrace! I never get tired of looking at it, and it is just as magical at night! I think we are at the opposite end of the village to you. Have you been to the bar (La Taverna) where there is flamenco guitar on Saturday nights? And my favourite restaurant ‘La Fuente’ overlooking the square? Last time we were there we dined on the terrace, with swifts and swallows whizzing over our heads! We would love to join you in Gaucin for a drink. Let us know what works best for you. Where is La Taverna? I thought I’d found everything in Gaucin! We had really great tapas in Sabillinas the other afternoon at a restaurant on the beach called Sisters. It was run by a Dutch couple, the food Indonesian inspired and here we were on a beach in Spain! We felt quite international! Hope you are still having a great time, and are not TOO hot !!! !